I'm back again with another day of April Lawn Fawn Inspiration Week. Today I have 2 cards to share both made with the mini set Dream. I adore these cut little feathers. I've seen lots of feather sets out there but I have to say none are as cute as this one, it's that cute Lawn Fawn style. And it has matching dies too! 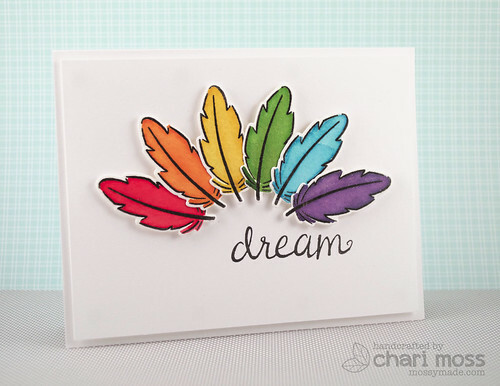 For this first card I heat embossed the large feather image on water color paper and used the matching dies to cut them out. I watercolored them using distress inks and a water brush. It had to see in the picture but I also added some Wink of Stella glitter to them as well. 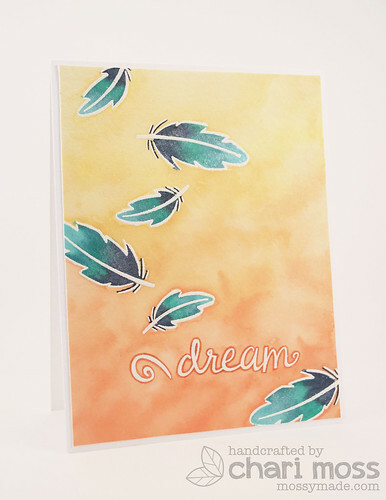 For my second card I white embossed he feathers and sentiment on watercolor paper and use distress inks in Dried Marigold and Scattered Straw for the background and distress markers to color the feathers. I used perfect pearls mist to blend the colors of the feathers which gives them all a lovely shimmer. I used the small tip of the Dried Marigold distress marker to trace around the sentiment and make it stand out from the background more. Be sure to check out the Lawn Fawn Blog to see more inspiring projects! Pretty cards I love the cheerful colours. Absolutely nuts about your coloring skills. Gorgeous. fun, but great first card. I am not usually a fan of feathers but these two cards are fantastic! So pretty! I am going to have to rethink feathers!! Beautiful cards!!! I love this stamp and die!! I love the rainbow colors! Thanks for sharing your amazing cards! I love the way you used the feathers. Great cards!! Your cards are beautiful. You are very talented. These are fabulous cards. I really like the colors and designs of both! Great job!